Imagine if you took an armored four-door SUV and outfitted it with a semitruck engine, chassis, and suspension. That's pretty much the principle Oshkosh used to build its M-ATV. This four-wheel-drive multi-purpose all-terrain vehicle (M-ATV) is based on the six-wheel-drive Oshkosh MTVR ("7-Ton 6x6) chassis and includes Oshkosh's TAK-4 independent suspension. In an effort to shield the soilders inside, the M-ATV is heavily protected and weighs almost five times more than the Humvee. The Israeli defense company, Plasan, built the armored body in conjunction with BAE Systems. To get this mass moving, Oshkosh selected a 370hp Caterpillar C7 diesel engine. Is that the new Baja 1000 M-Truck vehicle?? 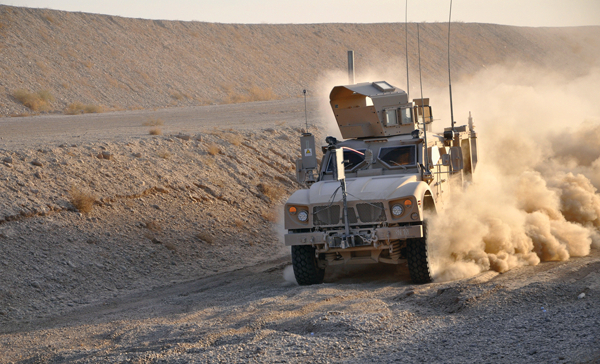 or more like the lighter ""Sandcat", a Oshkosh Tactical Protector vehicle? ?